The towering pinnacles of the Na Pali Coast... the "Bali Hai" cliffs that you see in movies... these landmarks and more await aerial tourist of the Garden Isle. Kauai, its lush flora often inaccessible to the motorist, best reveals its hidden beauty from helicopter aerial tour, which combine sightseeing with adventure. It is the most practical way to see the island when time is limited. The Wailua River winds its way through dense tropical growth and by settings reminiscent of centuries gone by. The Wailua area itself was royal grounds in the olden days and is associated too, with many legends of the Menehunes, those mysterious and dwarflike people who may say, lived on Kauai before the appearance of the Polynesians. While cruising along the Wailua River, boat operators share the fascinating legends of the area and family members entertain with Hawaiian songs, old and new. The destination of this voyage is the famous Fern Grotto. In this beautiful, tropical jungle setting, nature has formed a natural amphitheater with acoustics that are remarkable. This is one of Hawaii's greatest natural wonders, known as the "Grand Canyon of the Pacific." Dry and rugged, this rust colored chasm is easy to see by driving up Highway 550. 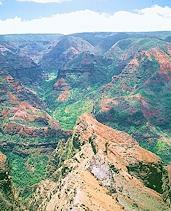 Pull over at several lookouts to see the 10 miles long canyon that's a mile wide and 3,600 feet deep. It is a great photo opportunities and unbelievable sightseeing tours!